Published on December 18, 2018 in Allenatori, Calcio, Generale, Giovani, Mental coaching and Stress. 0 Comments Tags: Cagliari, focus, goal, guardare, MIlik, Napoli, respirare, rete, tirare. Published on May 24, 2018 in Allenatori and Calcio. 0 Comments Tags: Carlo Ancelotti, lavoro, Napoli. Published on October 18, 2017 in Allenatori, Calcio and Stress. 0 Comments Tags: Manchester City, Napoli, Sarri. Napoli vs Manchester City match teaches us that the fear of the opponent can become numbing experience. My question is: during the week, instead of spending so much time just talking about game plan, it wouldn’t it be more useful to address the issue of crippling fear and strength? And, of course, establish and train the attitude to play these games. Play schema are required but, if the players have not learned to use their mind constructively, they are only one way to find out how you should play. 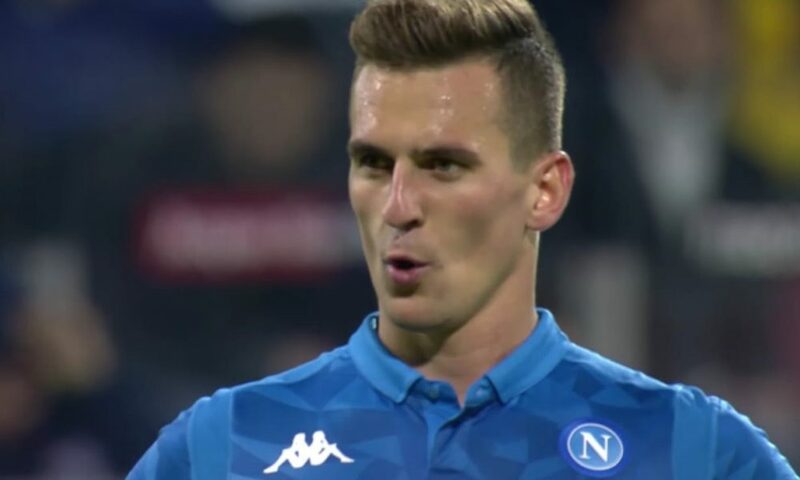 The penalty miss from Napoli is another example of what happens when the fear dominates the mind. Published on February 16, 2017 in Allenatori, Calcio, Generale, Mental coaching and Stress. 0 Comments Tags: Champions League, errori, Napoli, Real Madrid. Leaders lead the team – Hamsik did it for too little time at high level, as well as other main players. It’s concentrated in a positive way – Napoli appeared to just concentrate and insecure in follow the instructions of his coach. Players are determined – Napoli lost too many balls at the beginning of the new actions, too many individual mistakes. These are signs of excess tension. It manages the high expectations that are created for the decisive matches – Instead players choked with these expectations of glory that have reduced the effectiveness of their game. Real Madrid went down but this team knew how to get out the game. Napoli went ahead but it couldn’t handle this positive momentum. It’s convinced to be able to win – you can win or lose but it must be cultivate tirelessly the belief that you will win if you follow the game plan. Napoli has probably shown this habit at a medium level but high expectations require high levels of physical, mental readiness, persistent toughness and high intensity match last 15m. Published on February 15, 2016 in Allenatori, Calcio, Generale, Giovani, Mental coaching and Stress. 0 Comments Tags: competizione, Napoli, perdere Il Mattino. Published on August 28, 2014 in Allenatori, Calcio, Generale and Stress. 0 Comments Tags: aggressività, Calcio, Napoli, Spagna. At the first big match of the new season Napoli has been eliminated from the Champions League. This was due, according to the newspapers in a “careless defensive line,” “a harmless launch from the sidelines, Albiol has not understood with Rafael, the two have made ​​surprise by Aduriz who burned them on time and he easily slipped the door was unguarded “,” the defense gives the score.” Regardless of the technical value of individual players and the team as a whole, these comments highlight the lack of psychological value of Napoli. Benitez has not build a fighting and determined team. The attentional errors did by Napoli have been made regardless of the technical value of the single player and I am convinced that aggression is an indispensable and trainable team quality if you want to compete at a high level in Europe. Little attention is given to the search for players who possess this mental dimension in favor of the search for even the most technically gifted players in the field but that will melt like snow at the sun. This parameter is too often forgotten and so, while in Europe the teams run and fight, we continue to complain. Published on February 13, 2014 in Generale. 0 Comments Tags: Calcio, Juventua, mentalità vincente, Napoli, Roma. Roma is playing a very positive championship. In fact, this year it has become a competitive team, showing how to win the most games with minimal losses. It’s on the right track to achieve a winning mentality, which means getting into the pitch with the confidence to cope successfully face any team. Compared to what it has been shown up to now, Roma has not yet reached this milestone, I testify, in my opinion, who has suffered two defeats in the two most important games he played. The match against Juventus in the league, which would allow her to continue to exert strong pressure on Juve same and the one against Napoli in the Italian Cup. In both lost the confrontation with the opponent in a clear way. The next step will be to maintain the same strong conviction even in the big games, which determine the difference between a good season and a great one. 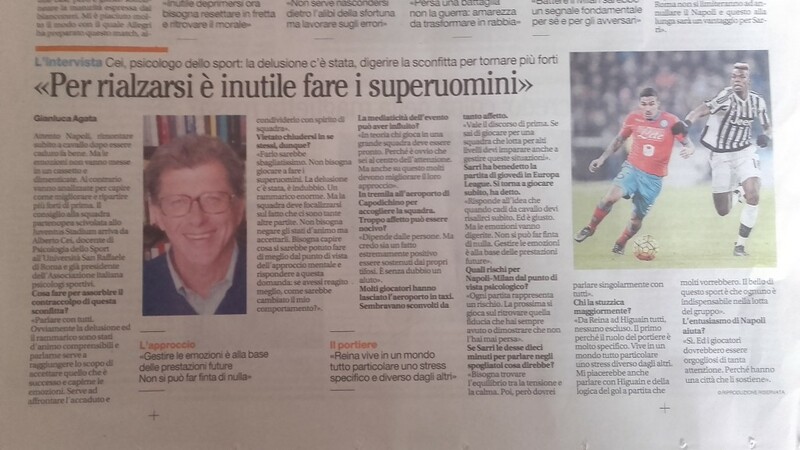 Published on November 11, 2013 in Allenatori, Calcio, Mental coaching and Stress. 0 Comments Tags: atteggiamento, Benitez, combattività, emozioni, Juventua, Napoli, Reina, Vincere. Yesterday I wondered who between Juventus and Napoli would have shown the will to win from the start of the game and Juve did it from the first moment. It would be useful to understand why this state of mind it has been demonstrated by Napoli only during the second time it has provided, as we say, “a proof of pride.” In my opinion an experienced coach like Benitez should have parameters to determine if before an important game his team is in the best emotional state to face an opponent that you know the game system and as well you know the fighting spirit that, his coach, Conte is able to convey to his players. With this awareness, you go in knowing what it’s very likely to happen the field and that really did take place. Of course the players are not robots that perform the Benitez’s order, however, a team that wants to win cannot enter the pitch with that attitude. So I think it is important for Napoli to understand how the attitude of the players has been so dismissive, you may be inferior in terms of quality of play, but not in relation to the will to face to the best of your abilities the opponents. The only one who has shown a positive approach was Reina, the Napoli goalkeeper, who has played his role with determination. Napoli needs to improve its ability to go in the field with the emotional condition allowing to play a game with determination, otherwise the class of individual players and the team will remain locked in a drawer where you’ve lost the key. Juventus-Napoli: who wants to win? Published on November 10, 2013 in Allenatori, Calcio and Mental coaching. 0 Comments Tags: Juventus, Napoli, Vincere. Juventus and Napoli face off tonight, an important game not only for the 3 points that approach the Roma who wins, but also for the positive effect that this result will have on the team self-esteem. With different words, Mazzarri and Conte will explain to the players what it must happen in the pitch and what they want to avoid that happening. We’ll see who of the two will be able to make happen what that they have planned in these days. Will they go into the field with the same will to win? The match will be beautiful if we will see intensity, speed, fighting spirit and ideas.